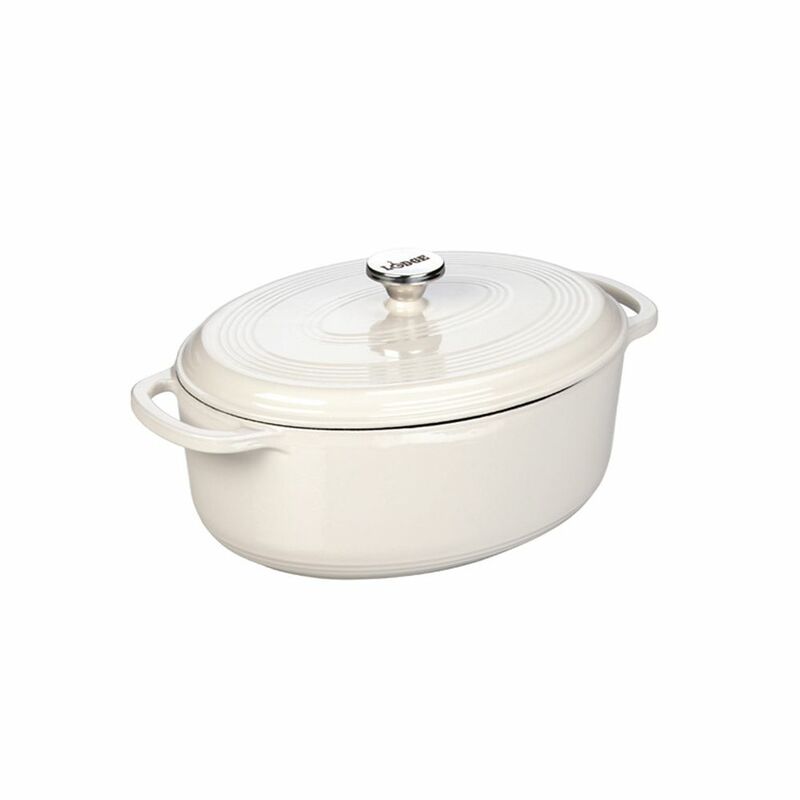 Enamel Dutch Oven, 7Qt, Oyster Since 1896, the Lodge family has been making cast iron cookware of the highest quality. We always strive to provide an unmatched experience at the greatest value. As times change and techniques evolve, we look to pioneer progress, but always with our roots firmly in place. Lodge's century-old tradition of excellence continues as we marry the benefits of cast iron with the beauty of porcelain enamel. Our enameled cast iron is made to our strict specifications by our partner foundry in China. Enamel Dutch Oven, 7Qt, Oyster is rated 4.7 out of 5 by 3. Rated 5 out of 5 by ssd63 from The Lodge 7 Qt. Oval Dutch oven so far has... The Lodge 7 Qt. Oval Dutch oven so far has surpassed my expectations. A far better product than two of the leading gourmet brands and at half the price! Rated 5 out of 5 by Laura from I love this dutch oven. It cooks beautifully and clean... I love this dutch oven. It cooks beautifully and clean up is easy. Rated 4 out of 5 by Kristin from Please be warned though that this is a 7QT oval... Please be warned though that this is a 7QT oval dutch oven, not 7.5QT as the product name implies. Beautiful cast iron vessel that performs as well as the higher french brand name. Love to use this for all types of soups, sauces and braising. The oval shape makes it especially nice for braising.